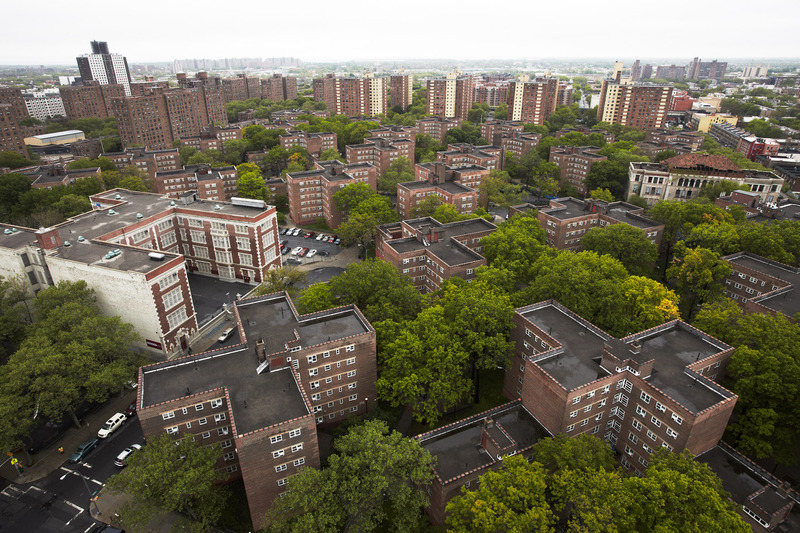 Brownsville has the highest concentration of public housing in the nation. Within one square mile, the community comprises more than 873 stories in over 100 different buildings. Many Brownsville residents say that the area has more sneaker stores than after-school programs. Brownsville has a total of three sneaker stores. A few years ago, Penny began hosting an informal after-school program so that children in her building would have a safe place to go after school. Virginia Smith has lived in Brownsville her entire life, but began swimming at the Brownsville Recreation Center (BRC) just two years ago. The BRC is one of New York City’s busiest recreation centers, one of the few safe havens for the young and old. Al is more of a neighborhood counselor than a barber. A jar of condoms he puts in plain sight makes his shop a place teenagers both rely on and trust. Al says his real work happens in the conversations that ensue while kids are getting their shape-ups or trims. Wendy’s son Tyquan was shot and killed last July after playing basketball in a court at the Howard housing projects. As a Sethlow resident, Tyquan was not welcomed on the Howard courts. A great ball player, he was awarded these trophies while playing in numerous leagues. Tyquan is just one of the many teenagers who are victims of turf wars in Brownsville. Since his death eight months ago, there have been twenty-three murders. Olivia recently formed the “Made Life Pretty Gunnas” (MLPG) crew, which is now made up of more than 50 young girls. Olivia feels that MLPG is her most dependable support network and would defend its members under any circumstance. She is currently suspended from school for fighting in defense of one of her group members. Donte is one of eight who live in this three-bedroom apartment on the sixth floor. He is in the third grade and wants to be a firefighter when he grows up. UPS driver Hakeem delivered packages without a security guard for about a year, until he was robbed at gunpoint while walking into a project building. As a Brownsville native, Hakeem had felt secure that he would be left alone, but it didn’t take long for reality to prove him wrong. The stolen package was left in the hallway, but the robbery motivated Hakeem to ask the company for an armed security guard. Retired NYPD officer Curtis accompanies him during deliveries in Brownsville and neighboring high-crime communities. Curtis carries two guns, a .38mm and a .9mm, for protection. “Loco” and his mom, Anna, live on one of Brownsville’s most notorious blocks, which, according to them, hasn’t changed a bit over past twenty years. Until 1960, Brownsville was a predominantly Jewish neighborhood. Leon Sternhell is now one of only two Jews still operating a business in the community. He has watched Brownsville’s crime rates increase as shops and storefronts are pushed out of the neighborhood. In response to the ongoing street violence, Mr. Sternhell locks the front door after every customer enters, and notes that if anything, this improves business, as his customers appreciate the safety precaution. Miss Martha, who has lived in the Dumont Building for forty-one years, has seen multiple generations come and go. She remembers everything—from her children’s and grandchildren’s birthdays to the many times she has stepped over dead bodies in the hallway on her way to work. Miss Martha currently pays $230 for her two-bedroom apartment. She does not have any plans to leave the projects, as rent would be unaffordable for her anywhere else. Toye Jackson aspires to save enough money and get out of the projects, but the systemic challenges she faces only work against her best efforts. As Toye’s salary increases so does her rent and she is required to pay as much as triple what other project residents pay for a unit of equal size.